Last October, the social network 'LinkedIn' launched a controversial Smartphone app called 'Intro' that intercepts and route all of your emails through LinkedIn servers to inject LinkedIn profiles of the sender directly into the mails. The app was released for Android, as well as iOS devices. Why Controversial? The app puts the security and privacy of your data entirely in the company’s hands, and at that time everyone criticized and reacted negatively, but LinkedIn defended Intro, claiming that all information was fully encrypted and deleted from LinkedIn’s servers immediately. Just two days back, I got an e-mail from LinkedIn with the subject line “We’re retiring LinkedIn Intro.” i.e. LinkedIn is giving up so quickly just four months of the launch! In a blog post today, LinkedIn SVP of products Deep Mishar explained, "We are shutting down LinkedIn Intro as of March 7, 2014. 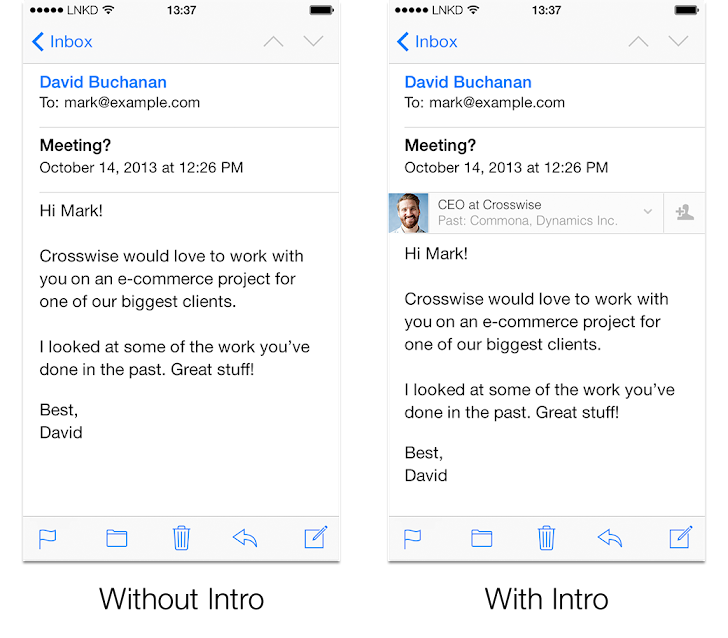 The intro was launched last year to bring the power of LinkedIn to your email Inbox on your iPhone. While Intro is going away, we will continue to work on bringing the power of LinkedIn to wherever our members work." If you have installed Intro app: LinkedIn says users will need to manually remove the functionality of their devices before March 7th for email to resume working correctly. You can continue to use Rapportive, a service that integrates LinkedIn into Gmail accounts and was acquired by LinkedIn for $15 million in February 2012. From your iPhone home screen, tap the iPhone Settings. Tap the General section and scroll down and tap the Profiles section. Tap all profiles that start with Intro to remove and remove all of them. In addition to the Intro, LinkedIn is also shutting down Slidecast, a service that enables SlideShare members to upload presentations with audio by April 30, 2104. "Slidecast users will be able to download their Slidecasts until April 30 and can continue to share the non-audio portions of their presentations with their network on SlideShare.net." he said. It was interesting to see that Apple Store allows such sniffing app to exist, but LinkedIn says the decision to shut down the service was its own. But it appears, Soon LinkedIn may again try a different method to integrate LinkedIn with user's email accounts.